← Women In Ministry In The New Testament! Prophecies include prediction of future possibilities. For example, if GOD says He would destroy a city, their reaction would determine whether or not He would change His mind like we see in the book of Jonah how God changed His mind from destroying Nineveh when the people repented. If God says someone would die, their reaction to that prophecy would determine its fulfillment. God sent the prophet Isaiah to king Hezekiah when he was sick, telling him to set his house in order because he was going to die, but Hezekiah turned his face against the wall and prayed to God and wept bitterly, pleading for his life. God changed His mind and sent the prophet Isaiah back to him to declare that He has cancelled the death verdict and added to his years. If Hezekiah had defied God or said nothing, he would have died. When Eli the priest refused to cub the sinful practices of his corrupt sons, he got a prophecy of God’s judgments from the mouth of Samuel. Instead of repenting, bringing correction to his house and pleading for mercy, he accepted it and said something like, “He’s God let Him do whatever He thinks”. Eli eventually broke his neck from the shock of the judgments he had refused to avert over his household and he lost his life (1Sam. 3). Was it God who created that future or Eli’s bad choices? We often blame God for stuffs that we bring upon ourselves by running on self-will. In a wider sense, God wouldn’t determine our life without our agreement; He will not overrule our power of choice. Two can’t walk together except they agree and that includes God and human (Amos 3:3). If GOD says so and so would marry or become this or that, their reaction and choices would determine whether or not it would be because God doesn’t coerce people’s free-will. I’ve seen many relationships pioneered on positive prophecies end up in divorce and heartbreaks, not because God is a liar or the prophecies are untrue but the parties involved through their poor choices overruled those future possibilities declared in the prophecies. This is why some accurate prophetic voices’ marriage ends in divorce today and church folks begin to wonder if they didn’t hear God in the beginning. Well, lots of times they heard God and others even confirmed but the poor choices of either one or both parties later ruined the union. The willpower is very potent and if it is not submitted to God’s Word and the Holy Spirit, it could be disastrous. Even Jesus wasn’t willing to fulfill the difficult prophecies; the cross didn’t feel good on the flesh. He wanted to back out in Gethsemane when the going was very tough but He finally said to the Father, not my will but yours be carried through to the end. And what followed? Resurrection power! Name above all names! The throne! And He brought forth many more children for the Father! Destiny’s birthing ground isn’t easy and storms of life comes at marriages but if in the Gethsemane of our marriage, when the going becomes really tough, we would cry unto God, yielding our will fully to Him instead of backing out, our union will come out stronger. Following God’s will won’t be rosy but if we endure, if we’re determined, the end result is always worth it! In Genesis 24, Abraham called his eldest servant and committed him to the task of getting a wife for his son Isaac. Despite all the prophetic guidelines and angelic help that the servant had through Abraham in choosing a wife for Isaac and despite all the prayers and assurance from signs on circumstances plus the girl’s parent’s agreement, all that wasn’t enough, they still had to ask Rebekah if she was WILLING to follow them. Even though her parents and siblings would have loved to have her with them for at least ten more days, since she was willing to go, there was nothing anyone could do. Family ties are powerful but some decisions are personal (Gen. 24:55-60). Supposing Rebekah had said otherwise, supposing she wasn’t willing to marry Isaac, God would still have had to guide them again to another lady for Isaac. There is not only one person in the world that you can marry. God has many daughters and He will present you with the one He knows you could walk with, someone whose purpose and yours would perfectly align. However, if one is obstinate and wouldn’t follow God’s will, He would get you another one and it would be as if they’re the only person you’ve ever met because He would cause love to appear to you in them and them alone. God is the perfect Matchmaker! Don’t be naïve, looking for someone who has everything perfectly in place to marry. Follow God’s direction, God sees the future of the fellow He’s moving your heart to marry. Examine their fruits and follow them if you’re sure it is following God, and everything will fall in line as you both align with the Word and follow the Holy Spirit. Never let anyone use spooky prophecies to coerce your will to marry them, you can hear from God too so seek the Lord before saying yes and when you’re certain He’s leading you in that direction, don’t hesitate to obey. “Don’t be stupid like horses and mules that must be led with ropes to make them obey.” (Psalm 32:9 CEV). And mind you, don’t expect everything to be rosy and automatically fall in line just because of all the prophecies that you have concerning it, such prophecies are only guidelines to a possible future. It takes your collective commitment to make those things be. If you will not follow the Word and yield to the Holy Spirit, even with all the prophecies, nothing will work as it should. Marriage is the union of a man, a woman and God. It is two imperfect people aligning to the Word of a perfect God. Give the Word and the Holy Spirit the first place in your union and you will never be to a divorce court! WHAT IF YOU’RE TURNED DOWN? You shouldn’t be afraid or ashamed of being turned down, if a Vashti turns you down, God would bring you an Esther He has prepared in her stead. Two cannot walk together except they agree. However, it isn’t always a case of Vashti, lots of times it is just disagreement and difference in purpose and vision. Someone who isn’t right for you could be right for another because someone whose personality, vision, purpose and direction disagree with yours may agree with another. It is all about agreement and compatibility. Someone who won’t enjoy your own personality will enjoy another person’s. Someone may be dying to have something in you that another person despises. The reason someone disagrees with you might be the same reason why your own rightful partner will agree with you. If anyone ridicules you today because of your status when you propose to them, don’t worry, a queen is coming for you who will tell them one day, “Thank you for telling him no!” Not every ‘no’ that you receive is a pointer that you missed it, sometimes it is an opportunity for a better choice ahead. Good choices can lead us to better ones and better ones to the best. Renew your mind with the Word, follow the Spirit and you will be able to proof who and what is good, acceptable and perfect will of God for your life (Rom. 12:1-2; 8:14-16). Never tangle with someone who doesn’t believe in your future. No one who disrespects you deserves you. Don’t force yourself on someone who cannot discern your future, you’re too precious for that. 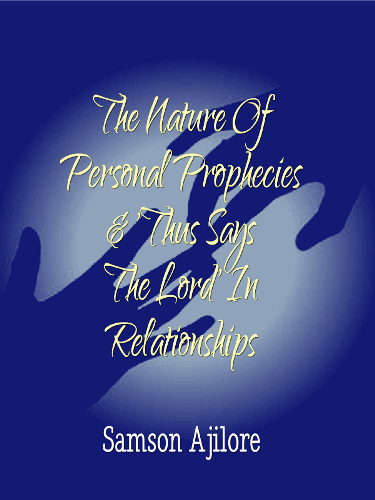 Prophecies on relationships are conditional since human free-will is involved. God isn’t a liar just because someone changes their mind! God doesn’t FORCE people to make personal decisions, He only presents them with good choices like He presented Adam with Eve and kept quiet for him to express his heart about her. And oh, the amazing prophecies that sprang forth from him when he beheld that beautiful damsel fashioned to suit him. He was intrigued by every feature and virtues she carried. She was his treasure and he was her security (Gen.2:18-25). If God can’t force people to be saved, He can’t force anyone to get married to another but He sure can guide them on who to marry since He alone knows the heart of all human. However, don’t be dumb when God is leading, don’t let your own selfish obsession and long list of expectations blind you from seeing who He’s displaying before you. There is no perfect human but there is someone who can love you perfectly and treasure you for eternity, marry that one! Nobody is flawless and no marriage is ready-made, it takes the collective efforts of the two to make it work and your degree of submission to the Word and the Spirit will determine the extent to which your union will prosper. Stick to the Word, follow the Holy Spirit and beware of negative third parties. People don’t need marriage psychology; they need to follow the wisdom of the Author of marriage, the Word of God. Psychotherapy will fail but Bible therapy of unconditional love, prayer and obedience will never fail. No one can teach you how to relate with your partner and make your union heaven instead of hell like the Holy Spirit and the Bible. Posted on July 11, 2013, in Miscellanous and tagged personal prophecies, Relationships. Bookmark the permalink. Leave a comment.